Pampena Motorsports is a leader in 3S development with cutting edge designs and world record breaking race car builds. We have built many well known 3S street supercars like Rays own which are capable of 9 second quarter miles and 200 plus top speed all while getting 25mpg!! We are also a leader in 3S engine development and sold by far the most 3S engines out there.. many are in the fastest/quickest cars and have broken many records. 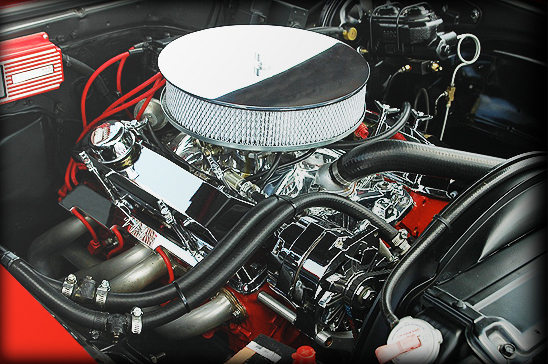 Pampena Motorsports is well known for building affordable, reliable engines from stock rebuilds to huge strokers! Dont take our word for it.. search "pampena motorsports" "Ray pampena" on google and read for yourself! All of our ASE certified technicians here at Pampena Motorsports have previously worked for repair shops and car dealers for many years. Together, we have years of experience working on all makes and models foreign or domestic. Our services range from general maintenance and tune ups to full overhauls of major components. We know what work needs to be done, and just as importantly, what does NOT. Many services dealers perform are not needed and are a waste of money. Your vehicle does not have to be serviced at the dealer to be covered under warranty! Under the Federal Magnuson-Moss Act, it states that the car owner doesn't have any obligation to have their car serviced from the dealership they purchased their car from. Owners are free to get their vehicle serviced by Pampena Motorsports or any other independent and skilled service station, without losing the warranty on their car. In addition to servicing, you are not obligated to use OEM equipment if you choose not to. The truth is some aftermarket parts are manufactured with quality and specs exceeding OEM standard specifications. The bottom line is having an honest and reputable facility like ours provide you with many options. We will take the time to offer you the most efficient and economical solutions for you and your vehicle. Automotive diagnosis is the most difficult portion of auto repair. Ray Pampena is a diagnostic specialist who was a lemon law vehicle troubleshooter for auto manufacturers. Ray is an ASE certified Advance Engine Performance specialist (L1) and can troubleshoot your problems fast and accurate, which in turn will save you time and money. We fix it right the first time! We perform any and all services for your 3S car. Anything from a tuneup to a 1000+HP build, we have what it takes to get the job done, and it has been proven time and time again. We are NOT the new kid on the block in the 3S world! *60K Tune Ups Includes: replacement of timing belt, timing belt tensioner pulleys and idler, air filter, spark plugs, ignition wires, alternator belt, power steering belt, throttle body gasket, intake plenum gasket, water pump, oil filter, and oil change. *120K Tune Ups Includes: replacement of timing belt, timing belt tensioner pulleys and idler, air filter, spark plugs, ignition wires, alternator belt, power steering belt, throttle body gasket, fuel filter, intake plenum gasket, water pump, oil filter, and oil change. *99 Conversions Looking to update the look of your first or second generation 3000GT? We have successfully performed several 99 conversions and are looking forward to transforming your car to a 99. *Brake Upgrades Want to go fast? You'll need stopping power to match that. We perform a range of brake services, including installation of six piston calipers and large diameter brake discs. *Clutch Replacement Whether its stock, street, or full race clutch components, we will ensure your 3000GT or Stealth clutch will be installed with the upmost of care. *Custom Interior Installs We can reupholster your old tired leather seats, install short throw shifters, custom gauge mounts, and so much more. *Cylinder Head Overhaul and Upgrades Port & polish, cams, oversized valves, and new seals. We do it all! Call us so that we can determine what application best suits your needs. *Front Mount Intercooler Solutions Installing a FMIC in a 3000GT or Stealth is no easy task, especially if you wanna go BIG! We have the experience necessary to get your FMIC installed properly and quickly, all with little modification to your bumper for a clean install. 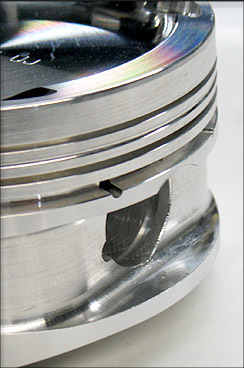 *Gauge & Accessory Installation We perform stock gauge replacements as well as custom gauge installs. *Suspension Installation and Adjustments Going left to right is just as important as going forward. We've installed several types of coilovers, lowering springs, control arms, sway bars, strut tower bars, and aftermarket replacement struts. Give us a call and let us help getting you going in the right direction. *Transmission Repairs Our transmission repairs are performed by a Certified Mitsubishi Master Technician. We are more than qualified and capable of repairing, reconditioning, and replacing any of your driveline components. *Trouble Shooting Is your car making weird noises? Does your car bog at a certain RPM? Can't get a straight answer? Let us diagnose your car and find the most efficient and economical solution to your situation. 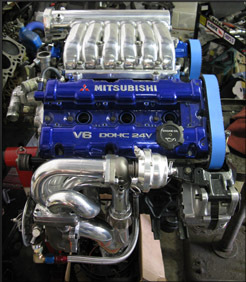 *Turbo Installations Our installations include oil change, coolant flush and replacement of your oil filter, turbo oil lines, turbo exhaust gaskets, and turbos. Maintenance Program This program is designed to ensure that your engine is performing efficiently. This program was also created based on critical failures found in numerous 3000GTs & Stealths that have been modified. We will ensure that your car will safely handle the power that you are looking to achieve. This program includes: 60K tune up, Bearing Inspection, Pressure Test, General Inspection and, if necessary, Oil Pan Dent Removal. Street Program 400 AWHP This program includes modifications & upgrades to your exhaust system, intake system, fuel system, and turbos. Street / Strip Program 500 AWHP This program includes modifications & upgrades to your exhaust system, intake system, clutch, intercoolers, and even larger turbos and fuel system. Race Program 600 AWHP This program includes everything listed in our street / strip program but with larger turbos & a race proven motor rebuild. Custom Program This program is for those who truly know what they want. If you have an idea for a customized setup for high or low horsepower, lots of show or lots of go, we can make your car exactly how you envisioned it. Give us a call to start building the car of your dreams today. We are NOT an "import" shop! We have a huge following building fast 3000GTs but our backbone is in domestic musclecars, hotrods, and drag race cars. Ray has owned countless muscle cars over the years and both Ray and Steve both own big block 1969 camaros. Ray worked for Merkel racing engines for over 10 years and has been building muscle cars since his teens. We also specialise in dyno tuning these cars for optimum performance! Let us find hidden power in your carbed or fuel injected vehicle.